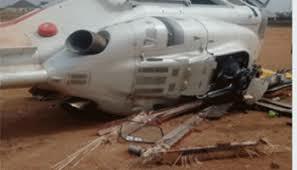 The Accident Investigation Bureau (AIB) has released a preliminary report on the cause of the crash of a Caverton Helicopter conveying Vice President, Yemi Osibanjo, in Kabba, Kogi State, linking the accident to the inability of the pilot to have a proper view of the field it targeted to land. The AIB blamed Caverton Helicopter, as operator of an aircraft conveying the Nigerian Vice President for failing to do an “on-the-site risk assessment” of the Kabba stadium field prior to attempting to land the aircraft given the dust usually generated during the landing of a helicopter. Commissioner/CEO of the AIB, Mr. Akin Olateru, who briefed aviation journalists in Lagos on Wednesday said preliminary investigations identified ‘brownout’ as the probable cause of the crash of the Agusta Westland AW139 with registration number 5N-CML. Brownout in helicopter operations is an in-flight visibility restriction caused by dust or sand in which the flight crew loses visual contact with nearby objects that provide the outside visual references necessary to control the helicopter near the ground. The AIB said investigations were however ongoing and appealed for public understanding until the final report was out. The AIB, however, has issued two safety recommendations to the Nigeria Civil Aviation Authority (NCAA) and the Caverton Helicopters to immediately implement to forestall a repeat of certain situations noticed in the course of the investigation. One of the safety recommendations made to the NCAA and Caverton was that the NCAA should issue an advisory circular to all helicopter operators flying in Nigeria to be alert to the possibility and effect of brownstone and that appropriate procedure should be put in place to mitigate its effects. While the second safety recommendation issued stated that all helicopter operators should ensure that flight operations are carried out in accordance with the company’s approved operations manual and that a survey and proper safety risk analysis be done before dispatching any flight to unapproved landing posts. The AIB, however, acknowledged that its investigations were somewhat hampered in that it failed to arrive at the scene on time to conduct drug and alcohol tests on the pilots. Olateru, however, said the conclusive report would make other areas clearer especially after analysis of data from the Cockpit Voice Recorder (CVR) information and the Flight Data Recorder (FDR) as well as analysis of data from the Health and Usage Monitoring System (HUMS) and Flight Data Monitoring (FDM) coupled with interviews from witnesses and further inspection of the crash site.